Review Context: I have played my share of twin stick shooter games. The ones that come to mind right off the bat are Mamorukun Curse, Hell Divers, and Dead Nation. 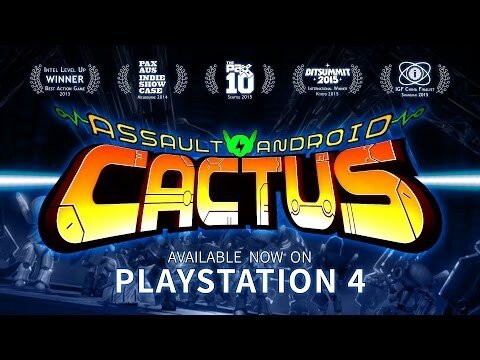 Assault Android Cactus stars a female cyborg named Cactus, who takes it upon herself to restore order to a civilian aircraft which has gone haywire, along with the high end bots boarding it. As she enters the ship, she meets three other similar cyborgs who also want to get to the bottom of things, which leads to them teaming up. Thus starts the adventure of these four cyborg ladies as they fight to restore the ship to working order before things get really out of hand. I was really excited for this game’s release for the PS4. I loved the emphasis on frantic and stylish combat and I felt this game could be a breath of fresh air in the top-down, twin stick shooter genre. So did this game turn out to be the fun and frantic twin stick shooter I was looking for? This game puts an interesting spin on the twin stick shooter genre. While you can get knocked down repeatedly by enemies, you do not die. Our protagonists run on batteries and as they mow down their adversaries, battery power-ups appear on the map, which allow them to replenish their battery. The batteries do not show up unless you defeat a certain amount of enemies, which essentially means you have to defeat all the enemies in the level as quickly and efficiently as possible to avoid your cyborg shutting down. Shutting down means game over. Fortunately our female heroes are very deft with their high-end weaponry, and many useful power-ups can be found within the levels to help them take down their enemies with style. You initially start with four characters, but as you advance through the campaign and defeat bosses you unlock more. There are nine characters in total, each with their own distinct personalities and weaponry. I enjoyed experimenting with each of them and seeing which ones work best for me. All the cyborgs each have their own unique primary and secondary weapons. The primary weapons can all be used infinitely, but the secondary weapons cool down for a few seconds after use, so use them wisely. Among my favorite characters to use are Coral, Starch, and Holly. If you like to be up close and personal, Coral is the character for you. Her shotgun is deadly at close range, and her shield not only protects her from incoming attacks, it also incinerates anything close to it within seconds. Starch is great for keeping a distance, while still doing considerable damage with her laser beam. Her missile launcher ability is a life saver in a pinch. All the characters feel and play differently, but they are all a blast to play with. The game’s campaign consists of five hub worlds, each with five levels, including a boss battle at the end. 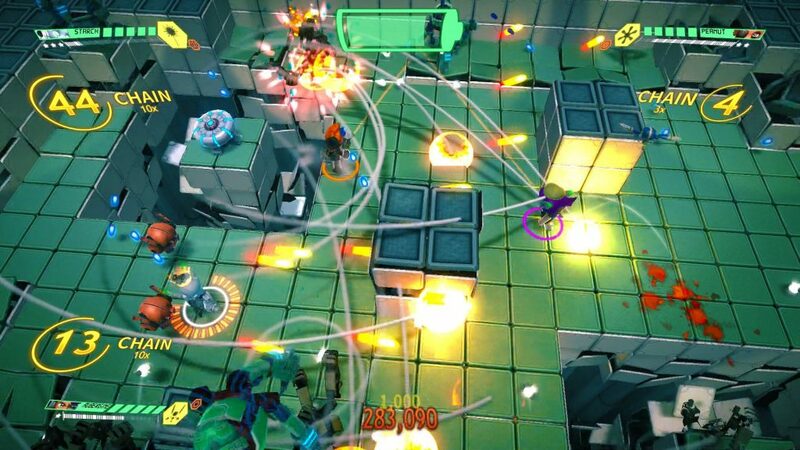 All these adrenaline filled levels are filled with stages that change on the fly and ruthless baddies, but fortunately the randomly generated power-ups help to exterminate them as efficiently as possible. The blue power-ups shutdown any enemy that’s currently on the stage for a few seconds, allowing you to make quick work of them. The red drops bring two droids to your side, who fight by your side, augmenting your fire power exponentially. The orange drops give you wings, giving you faster mobility and more evasive maneuvers. In short, utilizing these power-ups effectively, will give you a noticeable edge and a higher score. Speaking of high scores, this games does rate your performance at the end of each level and also has online leaderboards. The game’s actual challenge comes in trying to get the highest grade, which is S+. To achieve this, you cannot lose your chain combo or get knocked down at any time. 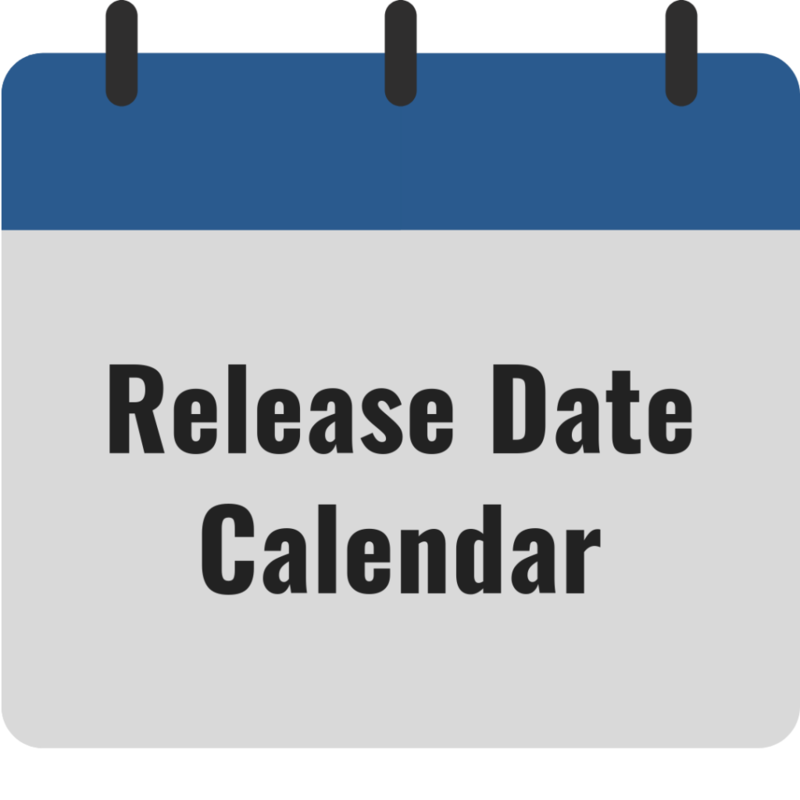 This is highly difficult and will take multiple sessions to accomplish, as this game does not hold back. At the end of each level you are also ranked on the online leaderboards, and earn money which you can use to buy character art, codex information, and ex options, which are pretty much in-game cheat codes. So whether you are trying to improve your grade for the levels, climb higher in the leaderboards, or unlock the extra goodies in the game, you have quite a few ways to occupy your time here. Outside of the campaign mode, you also have affinity, daily drive, and boss rush modes. Affinity mode is just a fancy word for survival in which you try to survive randomly generated levels and enemies for as long as possible. Daily drives can only be attempted once a day, and provide ten randomly generated levels, making each attempt a unique experience. The boss rush mode is self-explanatory. You take on every boss in the game and try to outlast them. The last boss really tries your patience, so good luck. These three modes are unlocked once you beat the main campaign and are all extremely fun. 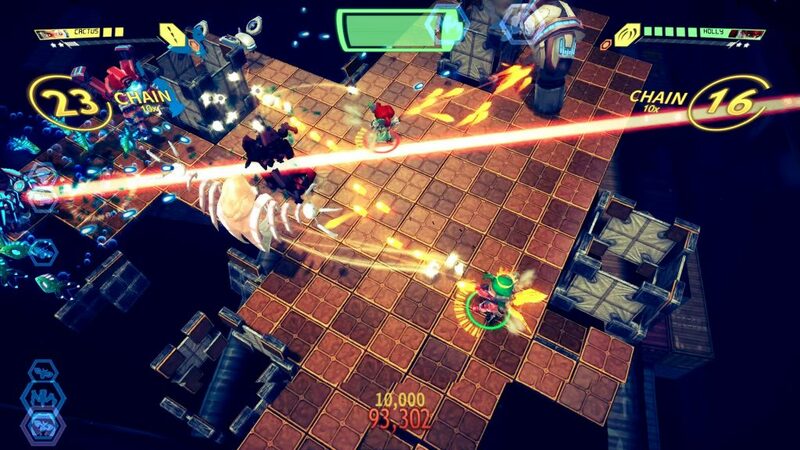 There is no online multiplayer, but there is four player local co-op. I was able to play with my brother, and while we thoroughly enjoyed the experience, there were a couple times where we got our characters confused. While the four player option is nice, I would not recommend it due to too much chaos on the screen. Two player mode is the definite sweet spot; while you do lose track of your character occasionally at first, you eventually get the hang of it. 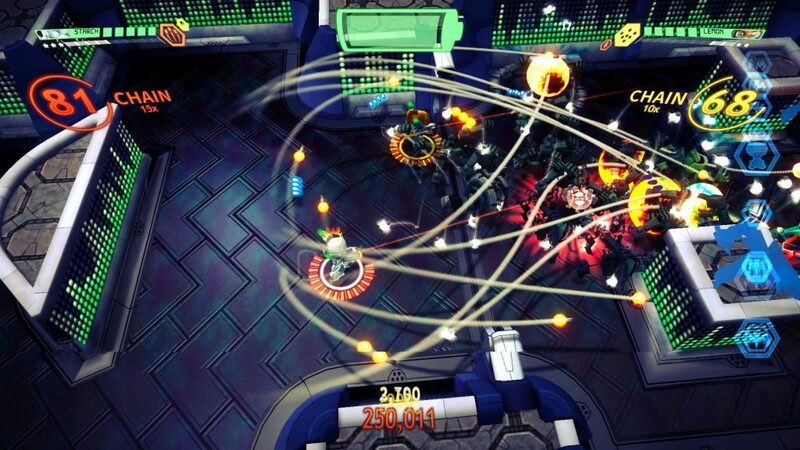 All in all, Assault Android Cactus was everything I wanted and more. The game is oozing with style and substance. The gameplay is as nerve wracking as it is exhilarating, the visuals and sounds further immerse you in the game, all the playable characters are memorable and are fun to play with, and the replay value is through the roof. I also appreciated the beautifully detailed galleries and character models you can unlock. They highlight the love and care the good folks at Witch Beam Games put into their game. If you are looking for a new arcade style twin stick shooter to sink your teeth in, give this one a shot. It’s a hell of a good time.